Situated in an idyllic garden setting, Eden Lassie offers magnificent views overlooking a small lake and the picturesque Tala Valley, just 40minutes drive from Durban and 27kms from Pietermaritzburg. 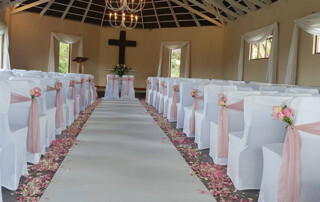 Whether you are looking for a picture perfect chapel, or a magnificent garden setting, Eden Lassie offers something special to even the most discerning couple. With seating for up to 200 guests in an open-rafter style venue, as well as an attractive wooden deck over the water suitable for pre dinner drinks and an idyllic garden setting perfect for your photographic shoot, Eden Lassie is a wonderful place to create memories that last a lifetime. Together with our appointed caterers, CHC, Eden Lassie strives to create unforgettable memories in this extraordinary location. 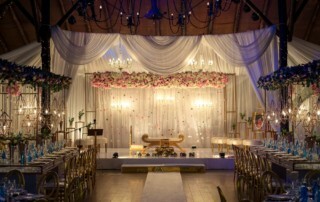 Your guests will enjoy fine food, breath taking scenery and a night to remember in this special venue. There is a variety of overnight accommodation available on surrounding farms should it be required. 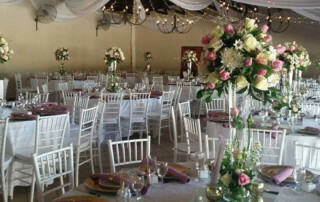 Limited to only one wedding per weekend, you are guaranteed access to the venue for your personalised setup prior to your big day as well as personal attention to detail by the owner manager, Judy Lowry. Although Eden Lassie offers no accommodation, there is accommodation available on the surrounding farms should it be required. Eden Lassie’s appointed five star caters, CHC, offer a selection of high class cuisine either plated or buffet style, with service to match. The bar is run through our appointed supplier and is very competitively priced. All details of the bar and items stocked are done on an individual basis. 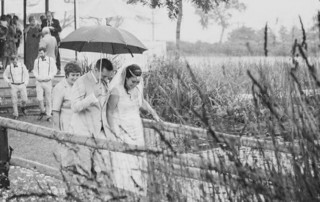 As no credit card facility is available on site, a bar deposit is required prior to your wedding or function.